Built with a proven Honda 220 cc (6.5 HP) gas engine, Graco’s GH 230 Convertible sprayers are ideal for the contractor looking to spray heavier materials in demanding applications. GH 230 Sprayers are capable of handling elastomerics, block fillers, gypsum, and dry fall. And with the ability to change out the pump lower and convert to electric power without tools, you can be assured that you’ll have the ability to tackle any job regardless of the location or conditions. Heavy-duty frame can be tilted on its nose for quick service in the field. Shroud support protects belt from jobsite damage. Flow-through Easy Out pump filter has an oversized surface and flows from the inside out, keeping the filter from collapsing. 4-bolt hydraulic head stabilizer keeps pump parts from prematurely loosening. Isolation-mounted engine cuts down on vibration. O-ring high pressure hydraulic fittings and form-fitted hydraulic lines eliminate leaks. High efficiency hydraulic motor runs quiet. Exclusive ProConnect system allows for jobsite pump removal and replacement (ProContractor Series only). Uses standard hydraulic fluid that only needs to be changed once a year. Hydraulic fluid tank design promotes efficient cooling. Compact, lightweight, and powerful, Honda engines are reliable, technologically advanced, and easy to start. Oil Alert shuts down engine if oil level drops too low, preventing damage. 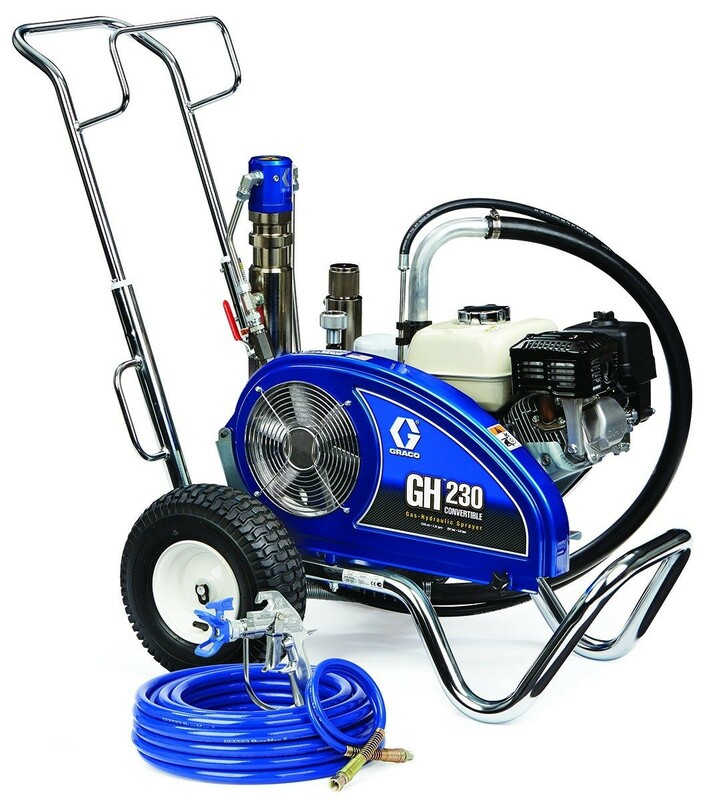 A hydraulic pump is only as good as its cooling system, and Graco’s innovative design allows the pump to run cooler and more efficiently. Innovative hydraulic reservoir is tapered on the bottom, allowing easier and more thorough fluid changes. Cooling fins on reservoir deflect heat away from sprayer. No special hydraulic fluid needed. With a Graco sprayer, it’s not just the mechanical parts that are built to last - our carts are built to deliver years of performance. Thick chrome over welded steel withstands rugged environments. Full pneumatic wheels absorb impacts and vibrations. Retractable handle doubles as coiled hose storage. Tilts on its nose for service in the field. The Easy Out pump filter is designed to filter from the inside out so filters won’t get stuck or collapse when filled with dirt or debris. Large 19.5 square inch filtering area reduces tip clogs and ensures a quality finish. Vertical filter removes with the cap for less mess. Graco’s hydraulic pump delivers rock-solid performance time after time and keeps you up and running. O-ring sealed fittings and form fitted hydraulic lines prevent leaks. Fewer moving parts mean less maintenance and longer life. Graco’s Endurance Pump is the most rugged and reliable pump on the market today. Chromex™ rod and hardened stainless steel sleeve deliver superior reliability and life. Knock-off foot valve allows for quick access. Maintenance-free design withstands high-pressure dumping. Quickly swap the gas engine for an electric motor in seconds—without tools! Everything you need to get spraying—RAC X™ SwitchTip™, spray gun and 50 feet of BlueMax™ II hose is included.